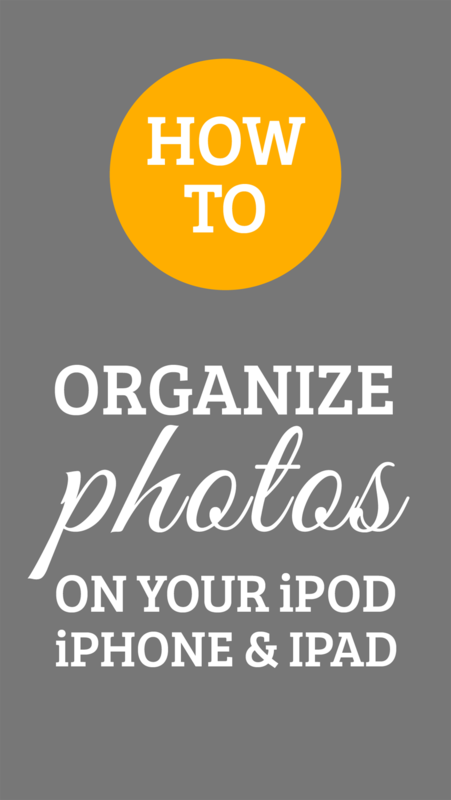 There are several ways to organize your photos. Some of you may choose to use an app like DropBox, some may use iPhoto for Mac, or perhaps just the standard folder system on your computer. There are many ways to organize them after you transfer them to your computer, but what if you want to organize your photos directly in your iPhone prior to transferring them? On your iPhone, select the "Photos" icon, which has the picture of a sunflower on it. Click on "Albums" in the bottom left corner. You may see several folders created already, if you've been taking photos on your iPhone for a while, or have used several different photo apps. I have 5 myself. To create a new folder, tap the + at the top left. Type the name of the folder and hit save. A screen will pop up that allows you to go ahead and move some photos. Select the Camera Roll folder to locate the photos you would like to move to the new folder. Tap the photos that you would like to move and press "Done" in the top right corner. To go in and transfer photos to this folder later, after it has been created and saved, select the new folder, press "edit" in the top right corner, press "add" at the bottom, locate the photos in the camera roll that you want to add and press "Done". *You will notice that the photos still appear in your camera roll. If you delete them from the camera roll, you are also deleting them from the folder that you created. Essentially, creating a folder is kind of like adding a hash tag. So each folder is a separate hash tag, but the main folder, the Camera Roll, contains ALL of the hash tags. Creating a separate folder in your Photo Stream is meant for sending to someone in particular and not for organization. If you hit the + to create a new folder, it's going to ask you who you want it sent to. So this is not ideal for organizing. The easiest way I find to organize my photos is to use the DropBox app. It just makes my life a whole lot easier, as I can create folders just like I would on my laptop, but also delete them from the folder they were in prior to moving them to the new folder. Also, if you download the DropBox app for your Mac or PC, it will sync your iPhone with the DropBox folder when you are near your computer, which makes it nice when I need to access a photo from my phone for use on my Mac. Here's a tutorial for How to Automatically Backup Your Mobile Photos With Dropbox.